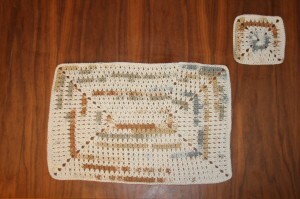 For one placemat and one coaster I needed one and a half skein. So with 4 skeins you could do 2 placemats and 2 coasters. Read the insructions carefully before starting! 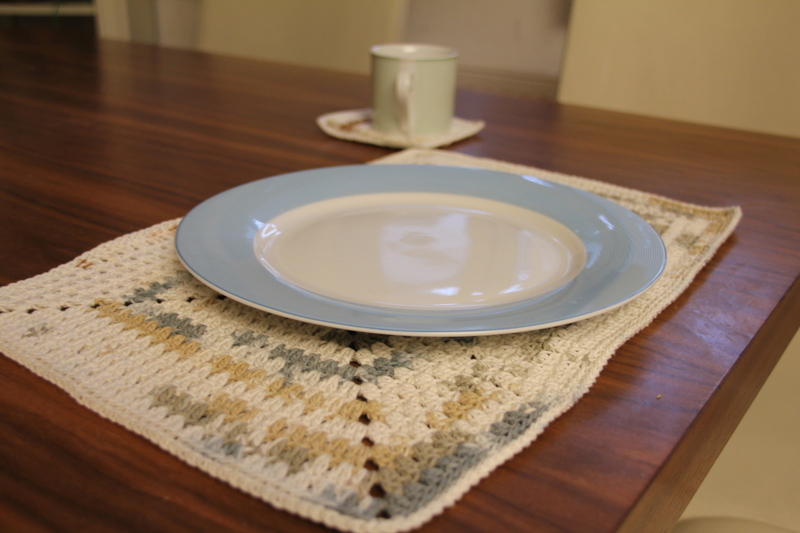 The round will be closed on the upper side of the placemat with a ss in the third of your beginning chains. 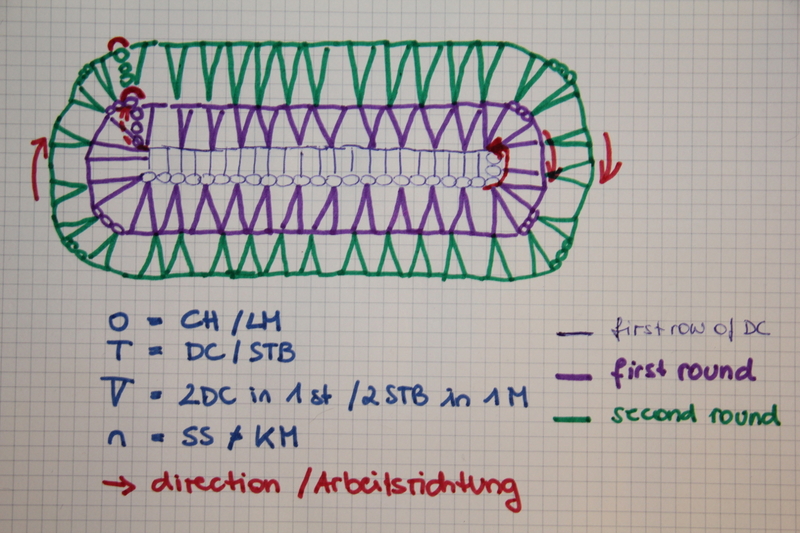 At the beginning you will have a lower number of DC on the upper side, but in the end of each round you will fill it up until you have the same number of DC on the upper and lower side! Counting is very important for this kind of pattern, but once you know how it works out, it’s pretty easy. So don’t give up if it’s not working at first! Ch 3, 1 DC in same stitch as chains, *skip 1, 2 dc in next Stich* repeat for the row , in last DC: Corner stitch, keep crocheting in rounds now ! So that is how the main pattern works. Keep going in rounds, until you have the desired size. I made 12 rounds in total and one round of sc BLO. one round of single crochet BLO , make 3 sc in corner stitch space. Fasten off, weave in the ends. has the same main pattern as the placemat, see description above! single crochet in BLO in each stitch around, 3 sc in space of corner stitch. Fasten off, weave in the ends. 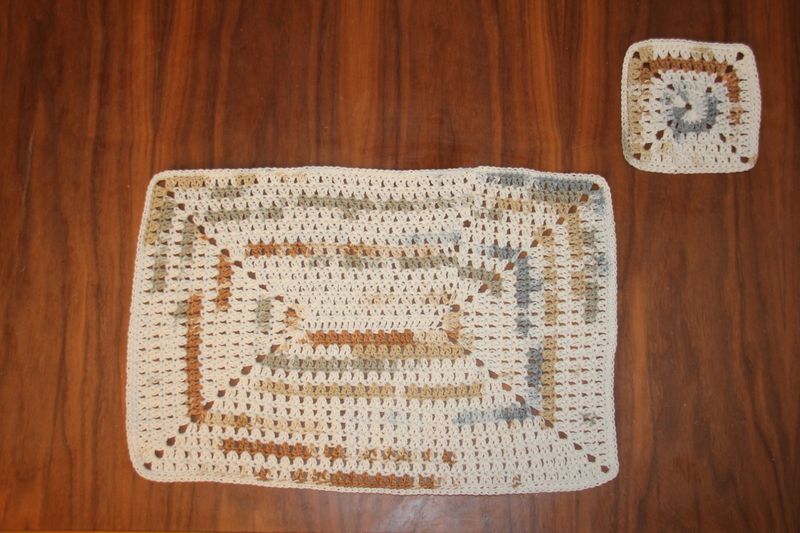 After finishing and weaving in the ends, wet block both pieces (find a “How to Wet Block” on Moogly’s Blog! It’s really helpful and easy to understand). If you have any questions regarding the pattern, don’t hesitate to ask, comment or send me an email!